Description: Place a card or flying disc (frisbee) in the machine then drop in paint and watch it swirl around to create unique works of art. We use the Fun Spinner for our spin art because of the extra safe design. The spinner only works with the lid closed which keeps little fingers safe. Spin Art is not only a fun activity, but the kids will also have something to take home. Make a memento out of the spin art cards with our specially sized and included spin art frames. 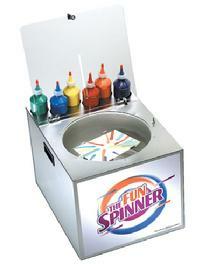 Kids LOVE making Spin Art ~ it is one of our top rental items. Great fun for parties, great money-maker for fund raising events. You will need to allow for about 5 minutes for the paint to dry.